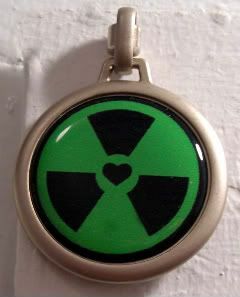 I was luckily enough to get a great seat to The Toxic Avenger Musical last week, where I picked up this keychain magnet. I'd never seen the 80s movie, so I went in completely blind. All I knew, was that it was supposed to be funny and campy. And it was. Hilariously so. From the moment the story opens in Tromaville, NJ, you're just not allowed to rest. The story was totally fast-paced, you don't stop head-bopping and toe-tapping until the end. I swear, it's a good several hours before the songs leave your head. I had thought of giving ya'll a rundown of the characters, but then I realized there were just too many memorable ones. The actors were superb - and with only five people playing all the roles, that's saying something. That's all I'm going to say, without giving away the game. Dudes. I can't even imagine the quick changes and in general running around backstage. Bravo. I'll come right out and say it. I love a boy with a guitar - bass, electric, acoustic. Doesn't matter. I love a boy with a guitar. Always have (see: Ode to John Taylor). The band was super awesome, the songs were terrific, and they totally rocked the house (which I can say with a straight face, given the 80s vibe overall). The set design? The production itself? FanTASTic. I guess on so small a stage (at the New World Stages - I think I saw Braveheart there back in the day), you need to be superinventive. Dang, did these guys make the most of that stage - up to and including the vertical real estate as well. Amazing. And just damned clever. So, what didn't I like? It's nitpicky, silly relating only to me, stuff. Remember, I was a romance editor, so I was never sold on the love story. And, well, there's a reason that I don't watch any of the CSIs. A reason why I totally look away during about 25% of Bones. I was sitting so close (in an already tight theatre), that I could see every little gross dangly thing hanging from Toxie's body. Ewwwww. Makeup/costuming - well done, you! Also, while I loved the loud music, I winced every time Toxie growled. He was too loud. Finally, I was a little put off by the violence and implied violence. But, that's me. I get upset when people raise their voice. Don't get me wrong - some of it was hysterically funny, ripping off of limbs and whatnot. Some of it was just too over the top. I know! I'm like the oldest mid-30s chick you ever did meet! I'll tell you one thing, though - the little boy seated beside me enjoyed the hell out of the show. I will say that one thing pissed me off more than anything...New World Stages are so close, that the audience is literally looking up actors' noses. (In fact, the little boy told his dad that Toxie was still breathing, when he wasn't supposed to be.) But, during the pivotal moment at the end, where the Sarah has Toxie lying in her arms, and all eyes were at stage center, like 2 feet from the edge - some jackass in the middle of the 2nd row stood up, and excused himself. I gasped aloud at the utter rudeness of it, as did many others. Seriously, I wanted to smack that guy. But you know what? The two actors, particularly blind Sarah, handled it well - they didn't miss a beat. So, bravo, Sarah and Toxie. Bravo. Anyway, definitely check out the show, but go to the bathroom first. Don't want to pee in your pants from laughter. What? It's a blogreview, man, not the New York Times. I'll tell it like it is, thank you. Thanks, Pieces. Email on its way. ESI, even with millions of people in NYC, it's still a small town. Weird to think that at some point, we totally would have met at some random party because of our friends. ITA about the mayor/mom - she was fantastic. Mindmeld! I saw signage for this today, for the first time.